Summer. Early afternoon. A soft and unassuming heat haze rising from the lush green meadows of Sussex. And rising too, slowly but relentlessly behind this pretty village, lies the reason that we’re here. The most famous climb in all of southern England. The mean city streets of London seem such a long time ago. The start in Clapham lies almost fifty miles behind us, and barely a handful more remain ahead. The countryside is peaceful. Very peaceful. The chatter and banter of those early miles has faded now. With a myriad and more of cyclists on the road, along the classic route to Brighton – you can hear them, all the way. Not just the whirr of spokes, the squeal of frantic brakes, or the grinding, mashing sound of crunching gears. There’s a richer, more lyrical sound to listen to, louder and more urgent still than the rhythm of the riders’ breathing. Much more than that. Because I’ll swear that on these Sussex roads you can hear the spirit of the peloton. And it’s true that the mood of the pack sings almost audibly along the roadside – the unspoken thoughts and anticipation of this mobile stream some twentyseven thousand strong, pedalling joyfully across a green and pleasant land. And now it’s fallen strangely silent. The pace has slackened, noticeably, for a mile or two behind. I listen hard, but it’s something else I hear now – the deafening sound of silent tension which hangs heavy in the air. Ditchling Beacon is in sight. The green monster, and it’s waiting for us just ahead. I gird my mental loins for a moment, and try to think. There was no marathon in the plan this spring – injury put paid to that. But all winter long, this ride has lain in front of me. It’s not a race today – with waves of starters spread out over four hours, that’s something this could never be. Long minutes ticked by at all those South London traffic lights. We had to walk one section, up a narrow chalky lane to Chipstead, because there was simply no way round all those other riders on the road. And so our time, our speed – they don’t matter. But all the same, today’s the day. Every Saturday since December, I’ve toiled an hour or two along my Surrey lanes. During all those months, I’ve panted my way up some of the steepest hillclimbs in the North Downs, done battle with the traffic, and tested both my mountain bike and my road bike too, into near destruction. The bike mechanic in our local shop now knows me well – with all my repairs paying for his fancy holidays this year, I think he should. And all for this – southern England’s most famous climb. The Tour de France returns to England next month. And on its last visit, in July 1994, it passed through here on its way from Dover to Brighton, staging one of its traditional ceremonies not far from our route today. 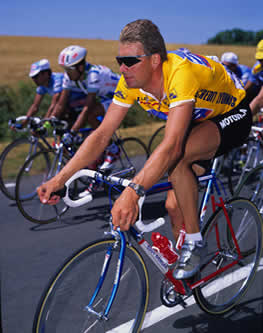 The whole race cavalcade, the caravan, stopped briefly in Forest Row to honour English rider Sean Yates, allowing him to enter his home village in front and pedal on alone to embrace his wife and son. Yates claimed that day as the proudest of his life, until a brilliant time trial in Portsmouth next day earned him the unexpected and timeless prize of a yellow jersey of his own to wear out of Cherbourg when they landed back in France. This climb has seen not just Yates, but Tour legends Indurain, Pantani, Riis, Svorada and Virenque, too. And now it’s my turn. I speak solemnly to my training partner as we leave the village. ‘Don’t wait for me,’ I say. ‘I’ll find you at the top.’ He tells me he’s not confident. I don’t believe it – he’s slaughtered me on every single climb, all year. I force myself to forget that, just for a moment, as I point my front wheel into a gap on the right of the road and concentrate on the task in hand. The field slows again, as we all strive to find the bottom cog. I gaze forwards as the road eases gently upwards through the trees, but then it’s lost to view around sharp bends. I’m running blind – unsure of what lies waiting up ahead. Others beside me have stopped to push, chatting raggedly as they wander up the climb. The walkers are spreading out across the roadspace. There’s still a gap to pass, but only just. I change down, for the very last time. There are no more gears now, just me and my ancient road bike, straining together. It’s hard work, but I keep it going as best I can, wobbling as I slow to pass mountain bikers, their legs pumping furiously as they flounder amongst ratios much lower than my own. ‘Refreshments – 800 m’ reads a sign on my right – that must be the top. I try to imagine that far, but I can only focus on the tarmac ahead. Just a few metres of it are in my view. 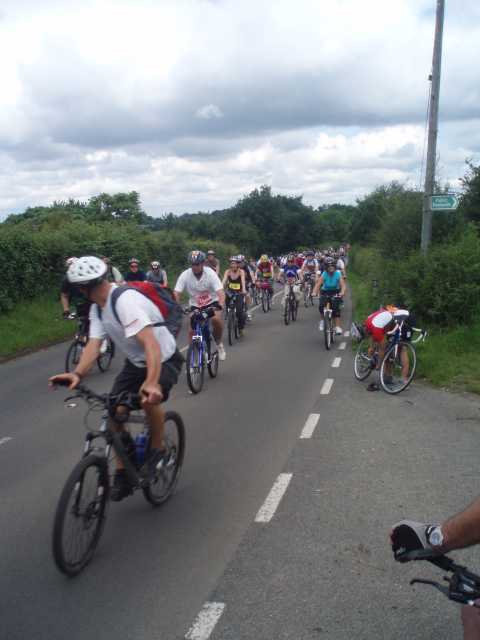 A mass of pushing bikes, the drooping helmets beside them telling their tale of a brave battle, fought and lost. My wheels keep turning. It’s a longer gear than I might have chosen, but I’m moving freely, all the same. I look to my left, where the trees are falling away in the sunshine now, with long grass and a big blue cloudy sky slowly opening up above. To my right – a steep slope rising ever upwards. There lies the heart of the green monster, still beating. A minute passes. Maybe two. Silence. Uncertainty. Doubt. Three hundred metres left. Two more cyclists dismount, right in front of me, and for a moment I almost stop. As I pick it up again, there’s a glimpse of clear road ahead and a strange, unfounded optimism rising somewhere. But still I’m waiting for it – the killer incline which I’m sure must lie ahead. Too many times this winter, I’ve pushed too early, and paid the price before the top. I struggle to control that urge to floor it, far too soon. The road snakes to the right this time. My eyes are stinging as sweat falls from my brow, and I lurch dangerously for a moment to swipe my wrist across my face. I stare down instead, willing the drops to drain another way, but it doesn’t work, so I look upwards into the tiny breeze instead. The road turns and turns. I’m not sure if it’s my imagination, but the gradient has eased, just a little. Tired legs can still fail, though, and not one walker is remounting here. I keep going. And then, suddenly, we round a bend, and the hillside stretches far and flat and level in front of me, the road a narrow strip of grey threaded through five thousand people milling all around. Tradition says I should grab a newspaper from a specatator, and stuff it down my shirt as insulation for a fast descent ahead. But there are no spectators, nor newspapers either, just other riders. I glance behind me – and the road is empty. My training partner didn’t pass me, so where is he ? I ride on a minute or two to find a space to stack my bike, and then I wander slowly back to the col. He arrives a minute later, panting as he pushes his sad machine up the final stretch. From atop the ridge, the Sussex countryside falls far away into the distance, looking northwards over all the ground we’ve covered. Fifty miles behind, and only five more left to Brighton. Six months I’ve trained, for this. But it’s much more time than that. Nearly twentyfive years ago I watched my first cycle race – and it wasn’t Le Tour, but transmissions from the Vuelta, the Tour of Spain, which gripped me, unexpectedly, in the midst of fieldwork through a long and chilly spring. Wet Sunday afternoons watching the contra-reloj from Cuenca in the Bar Rol John in Salas de los Infantes, and frozen nights under black Castillian skies as I wandered to dinner, wondering if Pedro Delgado had been caught at last today. Atop this hill, it’s not Armstrong, or Fignon, LeMond, Virenque or even Indurain I think of now. It’s another lone British rider, Robert Millar, climbing calmly and relentlessly on twisting mountain roads through April Spanish rain. And before I know it, that memory fades into a brilliant, scorching afternoon a few years later, high atop the Pyrenees in a famous Tour de France stage where Millar’s climbing gifts finally reached their peak. There are five miles more down to Brighton. Good roads, all downhill. A classic sprinters’ finish along fast and flat Madeira Drive. But this is not the Tour, so the traffic’s terrible, and it takes an hour. It doesn’t matter. Because this ride, this route, and to me, at least, the whole of cycling – it’s all about the climb. And this ascent of Ditchling Beacon – it’s the only classic climb I’ve ever done. The green monster of southern England it may be, but it’s far smaller than fifty others you’ll find on the Tour de France. Ditchling Beacon – in cycling terms, it’s just a pimple, really. But it was my hill, this year, and for once I made it to the top. 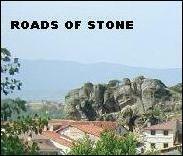 This entry was posted in 2007, A1 - the best of roads of stone, cycling, France, heroes, Spain, summer, Surrey and Sussex. Bookmark the permalink. 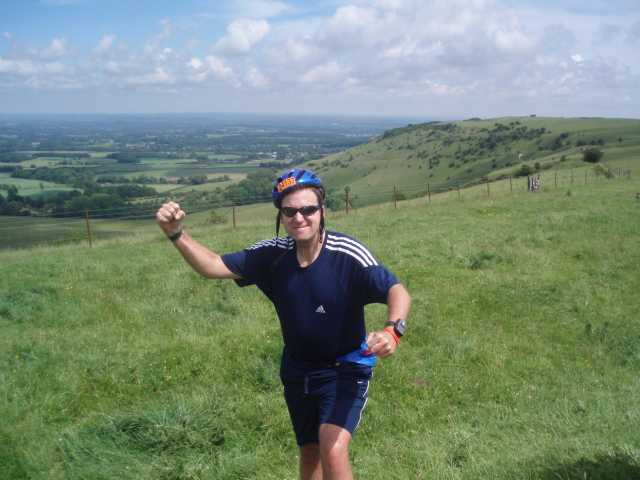 Hi, this is john in New Zealand, have just read your account of Ditchling Beacon. 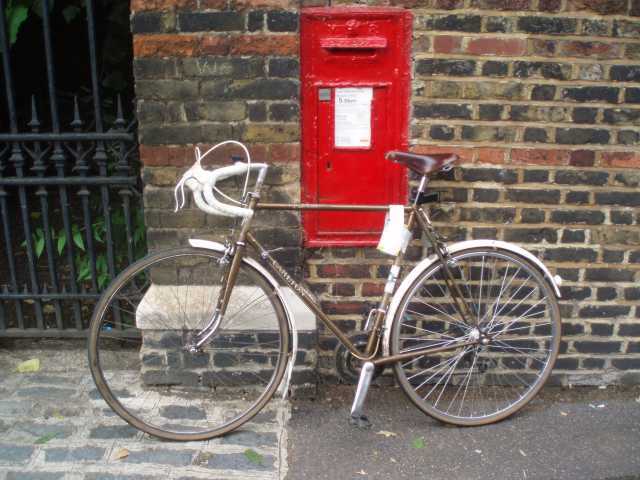 I have just email your story to my son in Kent – he rode it this year. I rode D.B. many years ago in my youth and it certainly made an impression then. Cant remember much of it now nearly 50 years later, how long is it and what is the gradient? I would love to have another go at it!! Congratulations, R. I´m glad you succeeded in this ride you told me about in Almería after taking part in its half marathon. I can see you have trained a lot not only running but also swimming and cycling. That´s fantástico! John – many thanks for your note from New Zealand. I hope your son had a great ride. Surprisingly for such a well-known and classic hill, it’s hard to find reliable statistics on Ditchling Beacon, but here is a summary. The climb rises from 90 m to 248 m over a distance of 1.6 km. The average gradient is 9.5%, although that includes a gentler lower section, and the final kilometre is at around 14 to 16%. That’s certainly not quite the 25% you can read in some accounts, but more than steep enough for a struggle, especially with 50 miles behind you. Here is a profile of the London-Brighton route which illustrates that point quite well. And thanks Antonio, too – it’s very good hear from you. This event isn’t quite yet in your league of Spanish monster mountain cycling, and fortunately the weather was mercifully much cooler than summer in Andalucía. I’m looking forward to running the Almería Half Marathon in January 2008 ! I didn’t think it possible but you’ve inspired me to break out the road bike and head for the mountains. Congrats on a great ride, it sounds wonderful. And yeah I agree, the climb is the best part. Thanks to you as well, Elayne. When I read about your cycling exploits in the Colorado Rockies, I’m aware of just how very puny these English molehills really are. Once, a few years ago now, I visited the famous Mont Ventoux, a brutal white mountain standing high and isolated in the fiery plains of Provence. Another British rider, Tom Simpson, was in contention for the Tour one year, and he pushed himself to destruction on that hill through blinding heat and amphetamines (this was 1967). There’s a touching memorial by the side of the road, where cycling fans from all over the world come to leave their tributes. It’s a 24 km ascent up to the summit of Ventoux from Carpentras, rising the better part of 2,000 m past lavender fields, through pine forest and finally over a bleak lunar landscape of unforgiving white lmestone. One day, I hope to return and do that climb myself. Anyone want to join me ? That’s an ambition long held, and publicly stated here for the first time. Thnak you for such a lovely journey. Do I dare admit it – I’m a genius on a horse (or was)….but I don’t know how to ride a bike!!!! I have always dreamed of learning, and tried to learn with my last born son, who got great fun of making it as difficult as possible for me, and me ending up i n the next door farmer’s dung pile! Now I cannot do all the sporty things I did before, and my ultimate dream is to find a grown-up’s tricycle so that I could put my little dog in a basket on the front, and pedal away visiting my lovely surroundings, without falling off and doing even more harm to my poor old diminuished self. I asked the local bike-shop….they have never hear of tricycles for grown ups….but I have seen them in films and books and on the tv! Sometimes you have to give up the sporty things you love, but you can always find another solution – so my idea of winning the national lottery is a tricycle for grown ups with a little basket in front for my dog or even my shopping and off I would go, seeing the beauties that surround my home, with my picnic aboard and a nice book. I’m sure “Mon Jules”, the dog, would adore that Any tips? Or should I just give up and say as of now the only country outing I will ever have are thru’ editorials like yours? At least I “travel” when I paint…..but I love countryside, fresh air, drinking up the beautiful sights to be seen…and I used to run 10 kms a day for years and it put all my ideas in place for the day to come – children, work on the house and the land, horses, tennis and the rest. Once I had run – all fell into place like a perfect puzzle. My head was clean, my heart was clean, my day was planned and I had seen so many lovely things on the way to feel my spirit all day. Thank you for the outing – even by proxy. If only….if only…here there is the garrigue, the southern lanes, the incredible colors…..but I need a tricycle or I’ll fall down dead! Wow, congratulations! And so well written – you’ve truly taken us along with you. Thanks. That had to hurt, especially the final k. But would you look at that great photo at the end! By all appearances, the hard work was all worth it. Diane – Thank you for your comment, and I’m full of admiration for your approach. I’ve done a little research, and it’s clear that tricycles continue to be used by both disabled and able-bodied enthusiasts alike. You can buy modern tricycles at Longstaff Cycles or Pashley Cycles, whom I see are based in my old home town of Stratford-upon-Avon. Prices look similar to top quality road and mountain bikes, and I’m sure they will ship to France. If those models look too pedestrian for you, then I also found this interesting and intriguing site – The Tricycle Association. They organise competitive tricycle racing in the UK, which involves some pretty exciting and high technology machines with carbon wheels. Ella – Thanks very much for dropping by, and many congratulations on the success of your site From Scratch. I’ll call in for some fine food and US political insights later on. BB – Many thanks for your encouragement as always – and, yes, I thought you’d enjoy my photo of that mad nutter we found gesticulating wildly by the roadside at the col.
All that EPO does terrible things to the mind. Allegedly. I loved the post Roads, it’s made me want to attempt the journey pretty soon, I’d like to pitch myself against that hill. Mind you I’m a little concerned that there was no mention of a cake shop at the top. I’m quite intrigued by the hills we have to offer in England. Stage 1 of the tour has a number of category 5 hills but when you compare these profiles to the worst France has to offer, it just rams it home what a tough event the tdf actually is. Wow… what a post. 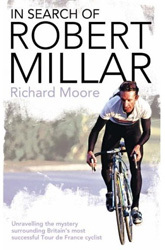 It had me digging out old photo albums and I’ve just put an order in for the Robert Millar book. Can’t say I remember much about La Vuelta in 86 (can’t help you with the TVE theme music, sorry) but July 1989, the year of the Millar footage you posted, was my first Tour de France in more ways than one. Set off at 6 one morning with my mate “stumpy Steve” on our racers and caught the old Weymouth ferry to Cherbourg with the hair-brained idea of cycling to Palermo. It seemed like a reasonable destination when we spread the maps on the living room carpet. Steve packed it in though whilst we were still in Normandy and took the St Malo ferry back home. He also took the tent. I carried on alone through the glorious French countryside, sometimes sleeping in youth hostels, sometimes sleeping in field. (Remember waking up one morning covered in snails!) Eventually joined up with the Tour de France near the Swiss border and a whole bunch of Americans, Aussies and Irish cycling nuts following “la grande boucle” from stage to stage. Wonderful memories. Lemonde, Delgado, grumpy old Fignon and his funny little specs, the Irish bouys Roche and Kelly, Super-U, Café de Colombia, Reynolds and Peugeot….as I leaf through the snaps I took I even found one of Miguel Indurain which I’d incorrectly labelled as Pedro Delgado. My own journey ended a couple of days after Lemonde had won dramatically in the final day time trial in Paris. Delgado may well have won if he hadn’t arrived late for an earlier time trial. Managed to hitch a lift to Calais with a lorry driver from Essex who strapped my bike to the outside of his cab. Sorry to ramble on but you’ve brought back a few memories. P.S. Is that an old, leather, Brooks saddle you’ve got on your bike? It’s probably worth a few bob if it is. That was highly remiss of me, Angela – not mentioning the cake which fuelled me up the Côte de Ditchling. A cherry cake provided at the marvellous Plumpton Guides’ rest stop, just a few miles before the climb. You can see from the photo that a long day on the road was beginning to take its toll on the rest of the field by then. Just 50p, and that cake did the trick for me. And welcome, too, Bierzo Baggie. I enjoyed the tale of your formative cycling odyssey across Europe in search of the Tour de France. Leaving England on a packet steamer from Weymouth at 6am for pastures unknown – that’s a journey which reminded me of ‘As I Walked Out One Midsummer Morning’ by Laurie Lee. A friend visited me during my fieldwork in the hills of Burgos on a similarly mammoth adventure in 1985. He had cycled all the way from Calais to Cádiz (inside ten days) and was then slowly limping back to Santander, distinctly thinner and very much fitter than when he set out. A few San Miguels were downed in the tiny bar at Mamolar to honour his arrival. Followed by 2 kg of pasta (it must have been before the days of EPO). I can remember that 1989 Tour extremely well, with Greg Lemond’s victory in Paris pulled out of the jaws of defeat, thanks to sheer guts, and possibly also his imaginative use of triathlon bars during the final time trial to the Champs Elyssées – their first ever appearance in the Tour, if I remember. Understandably, poor Laurent Fignon never recovered from the shock of losing a 3 000 km contest by just 8 seconds. And to answer your question, yes, that is a Brooks saddle, although sadly not the original, which had suffered from too long being left out in the rain during my student years. That saddle cost me a small fortune to replace, even a couple of years ago – certainly far more than the decrepit machine was ever worth. But tradition does need to be honoured. Thanks very much for bringing back some more great Tour de France memories, BB, and I hope to see you back here again very soon. Just found your review of the LtoB Roads – very interesting your personal battle to get to the top. Are you aiming to try it again this year? If so good luck with it! 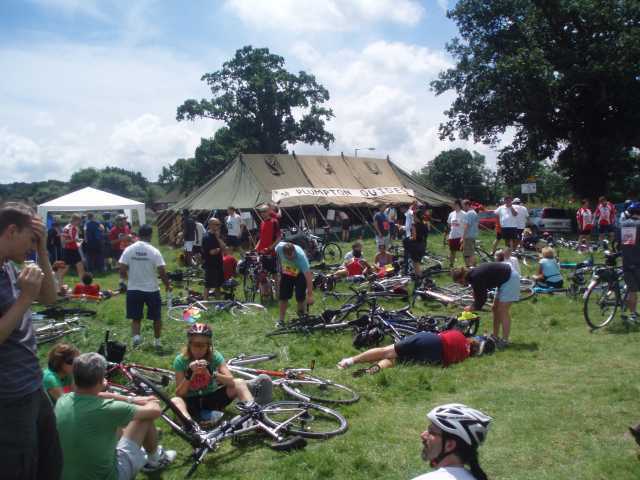 Great blog / great variety: the Hammers to Kenya to Tour de France – a tour de force – keep it up! Hi again, Trekker, and welcome back. Yes, I’m down for London to Brighton again this year, on 15th June, so thanks for the good wishes. Will Ditchling have grown taller since last year? I suspect it might just have done, and I’m going to find out. Many thanks for the good wishes and encouragement about the site, which I appreciate. I’ve been busy just recently, with too little time to write, but I’ve got some travel ahead with a few spare hours along the way, and so I hope to get back to the keyboard soon. Good luck to everyone to taking part in the London to Brighton Bike Ride tomorrow in aid of the British Heart Foundation. I’ll see you there. Whilst I’m pedalling, here is a great video which I found to enjoy. You’ll have tears in your eyes by the end. You’ll enjoy the event, Angela. It’ll be my third ascent of Ditchling Beacon, this time. Just two days to go before my third assault on Ditchling Beacon. My final week’s preparation has included an unexpected odyssey to Houston and back, and 20km of running in steamy heat under a summer Texas sky. None of this lies in the instruction manual before a major ride like this. I’m hoping for a cool day and a fair wind, and plenty more cherry cake at Plumpton to fuel me up the Ditchling climb. Good luck to the 30,000 others who will be taking part to raise money for the British Heart Foundation. Have fun along the route, and be sure to enjoy your day. Thanks, LTB. 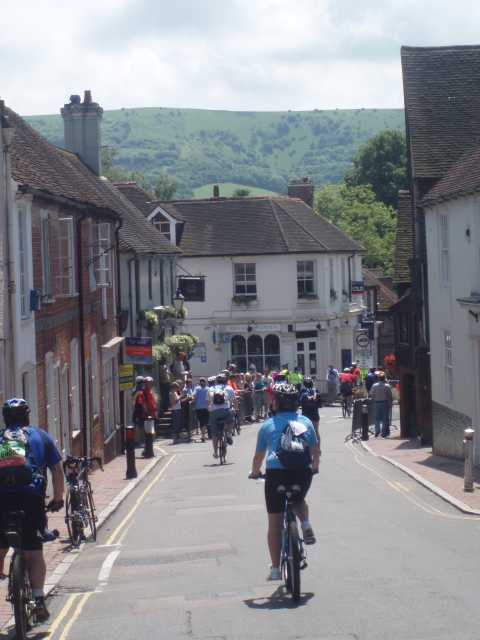 Good to hear you had a successful ride up Ditchling Beacon — always a challenge which must be far harder when you’re climbing on one lungfull at a time. Somewhat rashly, the last year or two I’ve been experimenting with different routes back home from Brighton, and will write more about that 100 mile day experience soon. Hi, I just completed London-Brighton on Sunday. Climbing Ditchling Beacon was worth the pain for the amazing views and downhill descent. I loved it! Beautiful description of climbing Ditchling Beacon. I too succeeded in climbing it this year (my 4th attempt) and your description is spot on. Fantastic sense of achievement on reaching the top though.